Based on our findings in the Diagnosis Foundations screening program, weakness of the Tensor Fascia Latae (TFL) is very common. What kinds of performance and health issues can you get from this? Let’s look at TFL anatomy, actions, measurement methods along with the implications weak TFL strength can have on your athletic performance and health. Anatomy – The TFL is located on the lateral side (outer side) of the pelvis and is superficial (towards the skin). The top of the muscle attaches to the front 1/3 of the iliac crest (this is the top most part of the pelvis just below the waist). 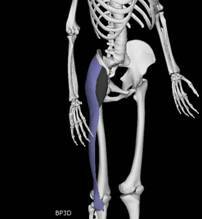 The muscle is relatively short (shown in black) and runs 3-10″ down the lateral side of the thigh. There it connects to the long fascia latae or iliotibial band (shown in blue) which runs down the side of the thigh and attaches to the lateral tibia, just below the knee. The TFL along with part of the gluteus maximus form the two arms of the letter “Y”. The long vertical portion of this complex is the iliotibial band. Action – The actions of this muscle are dependant on if it is working alone or in conjunction with the gluteus maximus. If it is working alone, the TFL performs a complex combination of the following motions. It will abduct the thigh (lift to the side), flex the thigh (lift forward) and internally rotate the lower limb. This results in the lower limb being lifted forward on the diagonal, half way between straight forward and straight to the side. 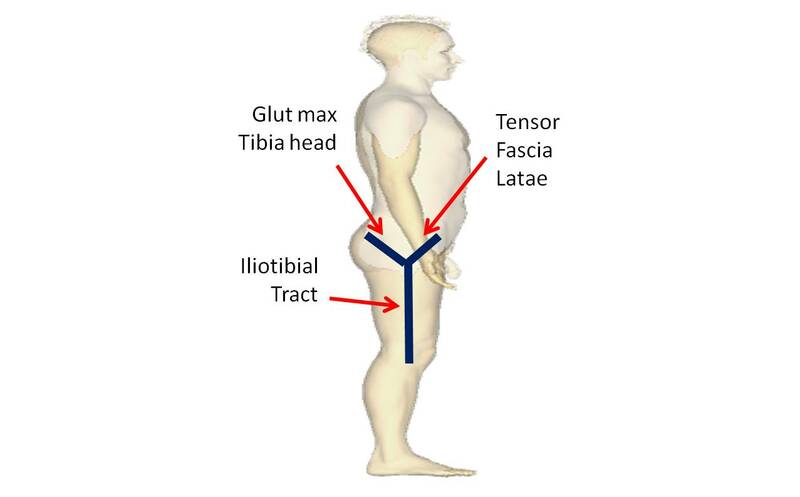 If the TFL works in concert with the gluteus maximus, it will abduct the lower limb or laterally flex the pelvis. Diagnosis – Weakness in the TFL can be determined with manual muscle strength testing, careful observation of pelvis alignment during walking, standing, running and other tests. Supporting information can be gained through a detailed history as well as physical examination for neurological, vascular and orthopedic signs. Measurement of TFL ranges of motion and exact muscle strength determinations are available with specialized equipment when required for more detailed examinations, insurance purposes or research. 1) Flexion of the limb to the forward diagonal – When working by itself, the TFL is directly responsible for forward diagonal motion of the limb. Forward kicks tn the outside diagonal as well as accelerating the body backward to the opposite diagonal will both use this muscle. The TFL will also be involved in braking forward diagonal movement of the body as well as braking the relatively rarely used backward cross over kick or back roundhouse kick. 2) Lateral Knee Flexion/Stability – This stabilization function is accomplished in conjunction with a portion of the gluteus maximus muscle. Although the knee joint does not have appreciable lateral flexion, the TFL / gluteus maximus combo provides critical stability of the knee in this direction. 3) Abduction of the lower limb – Straight sideward leg lifts or accelerating the body laterally to the opposite side will be the motions achieved by the coordinated action of the TFL and the tibial head of the gluteus maximus muscles. These same actions are also achieved by the direction of the gluteus medius working by itself. 4) Lateral flexion of the pelvis to the same side – When used in conjunction with the tibial head of the gluteus maximus, the TFL will help flex the pelvis and body laterally to the same side. This action also provides critical stability of the pelvis during one legged phase of walking or running. 5) Forward rotation of the pelvis – This motion is brought about by any of the following muscles: TFL; psoas; iliacus and rectus femoris of the quadriceps. This action is used in sit-ups or thigh flexion. Injury Susceptibility – In addition to performance degradation, athletes with weak TFL muscles, will be susceptible to increased rates of injury in each of the 5 categories of functions listed above. 1) Flexion of the limb to the forward diagonal – Hip joint imbalances are a consequence of chronic weakness of the TFL. The imbalances will place increased stress on the cartilage of the hip socket and femoral head and increase the rate of wear and tear on the joint. When the imbalance is severe enough for a long enough period of time, the risk of developing cartilage degeneration, hip osteoarthritis and eventual need for hip replacement increases. 2) Lateral Knee Flexion/Stability – The TFL and the tibial head of the gluteus maximus provide the only muscular support of the lateral knee via the iliotibial band. This provides critically important support for the lateral collateral ligament of the knee. Chronic weakness of the TFL will result in excessive knee lateral movement, gradually stretching the lateral collateral ligament. Over time, this ligament will become lax resulting in further excess mobility of the knee. As the abnormal hypermobility persists, chronic sprains, cartilage erosion and osteoarthritis will develop eventually increasing the prospects of knee replacement surgery. 4) Lateral flexion of the pelvis to the same side – Weakness of the TFL (or gluteus medius or gluteus maximus tibial head) can result in the pelvis rocking side to side excessively when in the one legged stance phase of walking or running. This excessive rocking will put increased pressure on the bursa’s in the hip region and increased friction on the iliotibial band. This is one of the major causes of iliotibial band syndrome. 5) Forward rotation of the pelvis – Weakness of the TFL can contribute to the pelvis rotating more posteriorly than it should. This will typically also result in a flattened low back. These abnormal postures will put excessive strain on the low back muscles as they work in a mechanically disadvantaged position. The lumbar discs will also receive increased pressure on them as the result of the posterior pelvis rotation and flattened low back. If present to a sufficient degree for a long enough period of time the risk of developing disc degeneration, neuralgias and spinal osteoarthritis increases substantially. Identification – Learn how to test for muscle strength imbalances with education & certification courses offered by the Diagnosis Foundation. Identifying muscle weakness early, enables you to correct these conditions before they reach a clinical state, when correction takes a minimal effort. Previous Previous post: Have you tried……. Next Next post: How many bones does the human body have?